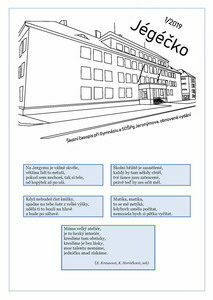 Welcome to Grammar School and Vocational School of Pedagogy Liberec, a leading co-educational school located in Liberec, the main city of the Liberec region. The experience of its teaching staff and the wide selection of extracurricular activities provide our pupils with a high-quality education in a friendly and stimulating environment. The building was first opened in 1933 and since then has always housed an educational institution, varying from the primary and junior secondary school to a grammar or a vocational school of pedagogy. Nowadays, the institution comprises of three schools – a grammar school, a vocational school of pedagogy and a pedagogical lycée. The grammar school was founded in 1987 and offers a full and balanced curriculum covering both sciences and humanities. In each academic year the school opens one class on an eight-year programme (where pupils begin at the age of eleven after just five years of attendance at primary school) and two classes on a four-year programme (for fifteen-year-olds pupils who have completed their full nine years at their basic school). The next school is the Vocational School of Pedagogy founded in 1976 for future kindergarten teachers and the last but not least one is the Pedagogical Lycée opened in 2012, preparing students for their further studies of pedagogy. The school organizes a variety of activities prepared to encourage team spirit among pupils of each class. All newcomers „undergo“ the induction days in the Jizera mountains. By participating in adventure games and rising to various physical challenges they strengthen their individual empathy and teamwork skills. Students with musical talents may join the school choir Gaudium. The compulsory physical education encompasses gymnastics, team games and ice-skating in season in the nearby rink. Facilities include two sports grounds and two indoor gyms. Besides these timetabled sports activities, in their first year the vast majority of students attend a one-week winter sports course; in the second year they take part in a one-week hiking or cycling trip. Jergym TV is an outstanding student activity, producing a TV report every month on the school events of all kinds – the leavers´ balls, the sports issues, various field trips, free time activities and the like. The team has had the opportunity to take part in the national meeting of school TV´s in CZECH TV in the form of workshops and discussions with well-known personalities. We feel today´s world needs to understand diversity and the least schools can do is to support this idea is to provide the opportunity. We are open to find partner schools around the world, so do not hesitate to contact us if you wish to visit us or establish an exchange.